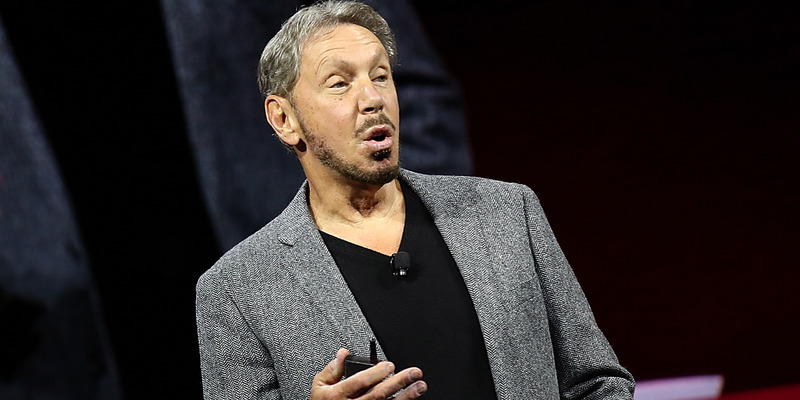 For the most part, Oracle founder Larry Ellison would rather trash talk Amazon than say anything kind about its founder, Jeff Bezos. But he broke that tradition when he was asked by Fox Business Network’s Maria Bartiromo about Google’s newfound anti-military policies. Ellison believes there’s some hypocrisy by a company that disdains the U.S. military while reportedly currying favour with China. In a wide-ranging interview with Fox Business Network’s Maria Bartiromo, Oracle founder and executive chairman Larry Ellison had a few choice things to say about Google’s newfound disdain for the U.S. military. “Well I think it’s actually kind of shocking. Here Jeff Bezos and I absolutely agree,” Ellison said, in a rare show of kind words for the competitor that Ellison spends most of his time these days trash-talking. Bartiromo had asked Ellison about the fight going on in the cloud computing industry over a massive cloud contract from the Department of Defence. The DoD will award the whole contract, worth about $US10 billion, to just one company. By all accounts the winner is expected to be Amazon Web Services. Oracle is one a handful of cloud competitors fighting tooth and nail to grab a portion of the contract away from AWS. Fox’s Bartiromo suggested that there’s some hypocrisy with Google’s policies: it doesn’t want to do work for the US DoD but Google is reportedly trying to return to the Chinese market with a search engine that the Chinese government can sensor. “I think U.S. tech companies who say we will not support the U.S. Military, we will not work on any technology that helps our military, but yet goes into China and facilitates the Chinese government surveilling their people is pretty shocking,” he said. To be fair, numerous Google employees are also protesting the company’s plans to return to China, just as they protested the military work. So the situation is more about whether Google yields to employee protests about China rather than a double-standard in the company’s business ambitions. If Google’s management had its way, it would presumably be doing business with both the military and China. Bezos has also spoken out against Google’s policies.”If big tech companies are going to turn their back on the Department of Defence, this country is going to be in trouble,” Bezos told Wired last week. Bezos doubled down by donating $US10 million to With Honour, a political action committee fund trying to get more veterans elected to Congress. He went on to say he views China as a big threat to the U.S. these days. “I think our big competitor is China, and that if we let China’s economy pass us up – if we let China produce more engineers than we do, if we let China’s technology companies beat our technology companies, it won’t be long that our military is behind technologically also,” he warned. Here’s a segment of the interview where he discusses China.